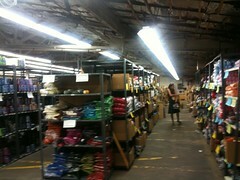 We began the day with a trip to Webs, a yarn store of renown in Northampton. 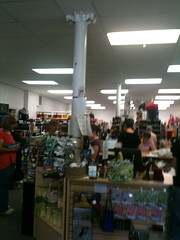 The front part is a large yarn store that looks much like any yarn store, with carpet and wooden fixtures. In the back, though, is a large yarn warehouse, full of tall metal shelves filled with plastic bags containing every odd scrap of yarn a knitter might dream of. From my point of view, the most attractive feature was the group of chairs placed at the front for the relief of beleaguered companions. There was clear evidence of whom those chairs were intended for: the magazines provided were things like Time, Sports Illustrated, and Golf Digest, instead of Another Six Thousand Things You Could Do With Yarn. I chatted with other companions, showed the iPad to the curious, read some of the magazines, updated our trip notes on the iPad, finished reading a book, bought another book on the iPad, and generally waited with the patience appropriate to someone with no belief that impatience would yield a faster departure. We returned at Herrell's for a farewell ice cream. 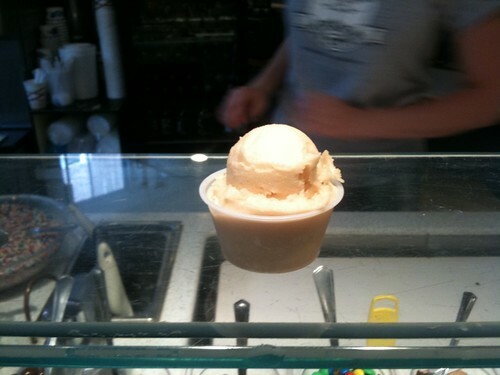 I had the cider sorbet, which was very apple-y, cold, sweet and good. Lori took the opportunity to correct a previous oversight. 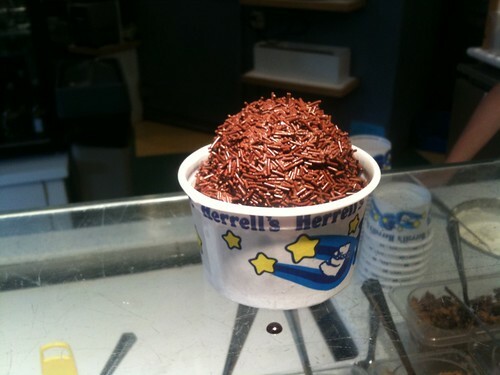 After our previous visit to Herrell's, she had read the praises of the chocolate pudding ice cream from http://www.roadfood.com/TheBest/NewEnglandIceCream/1-5646/herrells-ice-cream and was determined to sample it for herself. She found it good enough to swoon over, and considers it one of the best ice creams of a trip filled with many great ice creams. We bought a jar of Herrell's hot fudge sauce to bring home with us. Next: If I had known what we were getting into at White Hut, I might have avoided seeing it at its finest.